7 days in Land of the Thunder Dragon gives you the chance of touching the untouched. 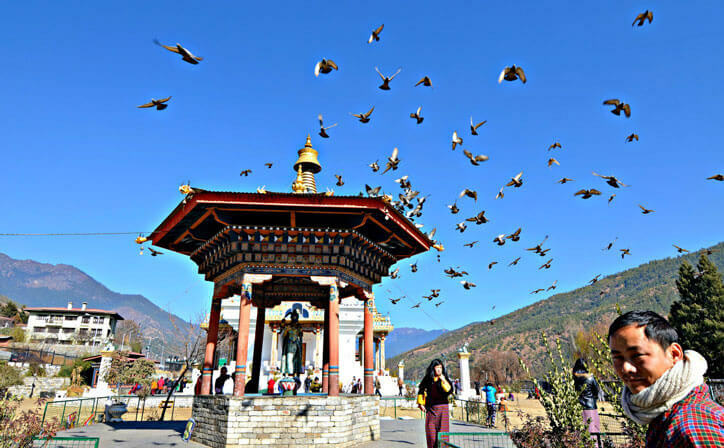 Virgin geographical beauty of Bhutan makes every bit of your effort worthwhile. Arrive at Bagdogra airport / NJP and meet our representative, transfer to Phuentsholing. Check-in at the hotel, process for route permit and spend the evening at your leisure. Overnight stay in hotel. Morning drive to Paro valley and visit the ruins of Drukgyel Dzong, a 17th century fortress that used to keep invaders from Tibet and in 1951 the fort was destroyed by fire. 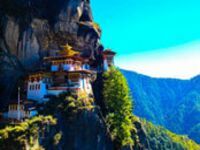 On the way back drive till the base of the world famous “Tigers Nest “or popularly known as “Taktsang” one of the popular spiritual heritage sites. It was here that the great tantric master Guru Padma Sambhava flew in from Tibet on a tiger to bring Buddhist teachings to Bhutan. Rest of the day at leisure. O/n at Paro. 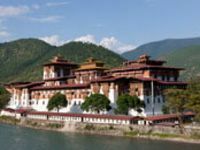 Morning visit, the National Museum housed in a round fortress called as the Ta Dzong considered to be one of the best natural history museums in Asia where it has a fine collection of natural and historic artifacts. Just below Ta Dzong lies Paro Dzong. 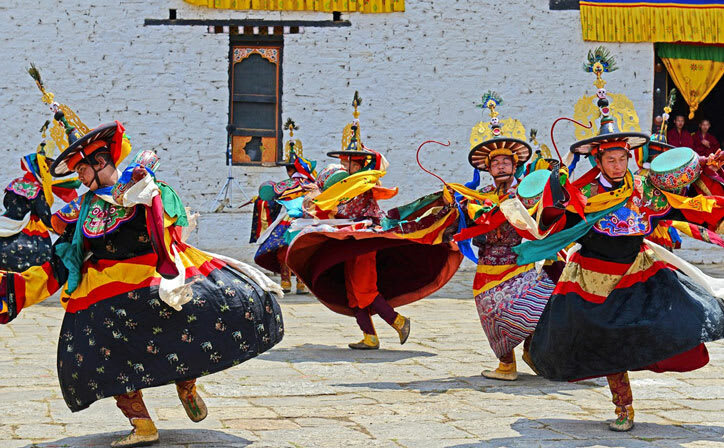 Afternoon visit Kyichu Lhakhang the monastery dates back to 7th century and is one of the oldest and most sacred and visit farm house where you will be able to see the lifestyle of the villagers of Paro. Visit the town for shopping or leisure. O/n at Paro. 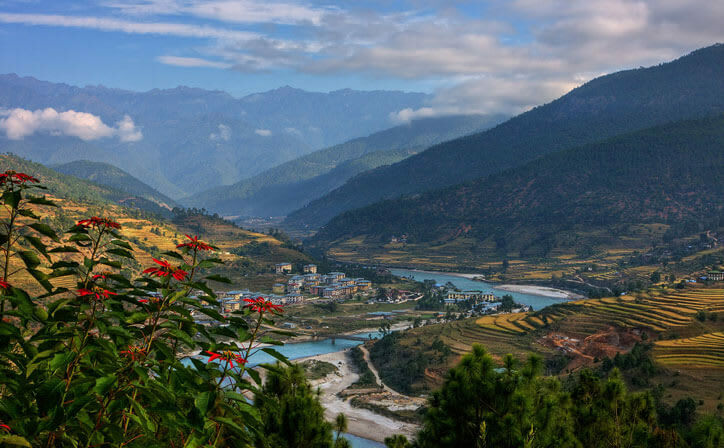 Bhutan is a tiny and remote kingdom nestling in the Himalayas between its powerful neighbours, India and China. Almost completely cut off for centuries, it has tried to let in some aspects of the outside world while fiercely guarding its ancient traditions. Within its small boundaries the ecological diversity is amazing. Tropical jungles in the south with elephants, rhinoceros, and tigers, coniferous forest in the mid region with leopards, mountain goats, bears, and variety of bird life, and blue sheep and snow leopards in the high temperature zones. 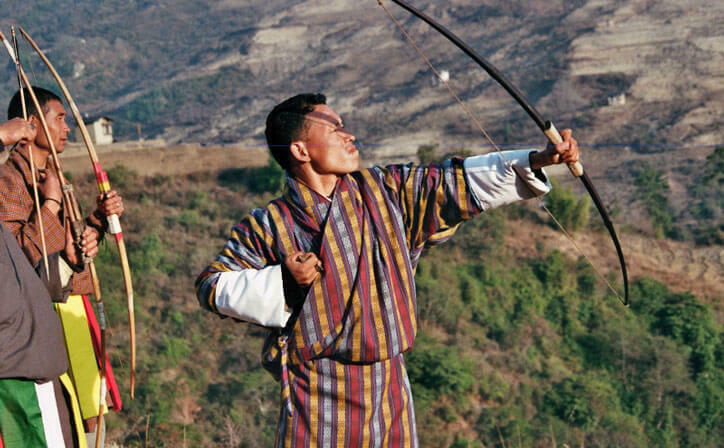 Through centuries of self-imposed isolation Bhutan has been able to preserve its spectacular environment and nurture its unique culture. ○ Transfer and Sightseeing by 01 Non Ac Sumo/Maxx as per itinerary point to point basis. ○ All transfers and sightseeing as per the itinerary. 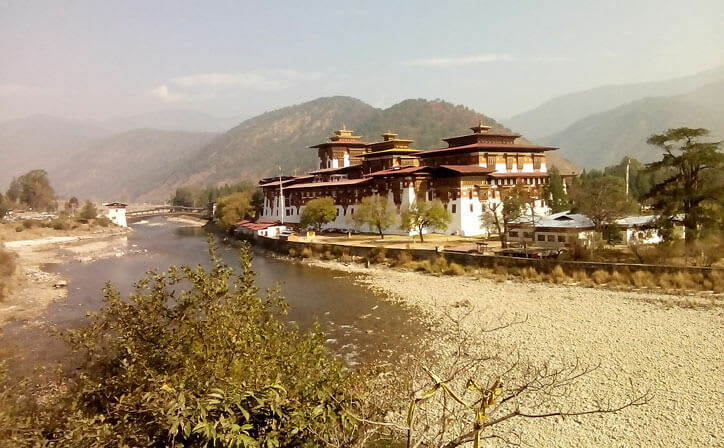 Punakha Dzong is arguably the most beautiful dzong in the country, especially in spring when the lilac-coloured jacaranda trees bring a lush sensuality to the dzong's characteristically towering whitewashed walls. 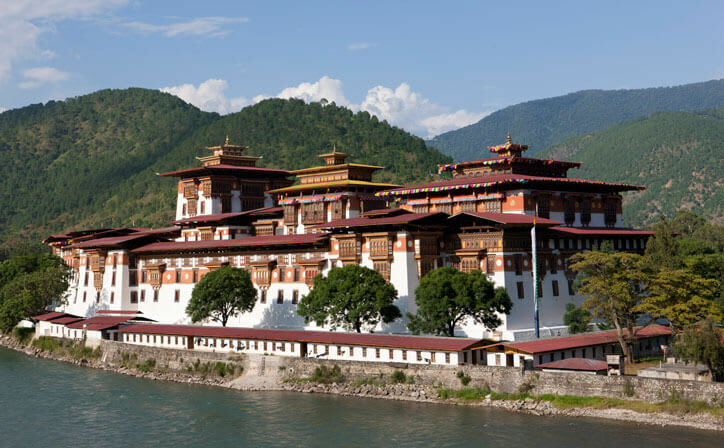 This dzong was the second to be built in Bhutan and it served as the capital and seat of government until the mid-1950s. 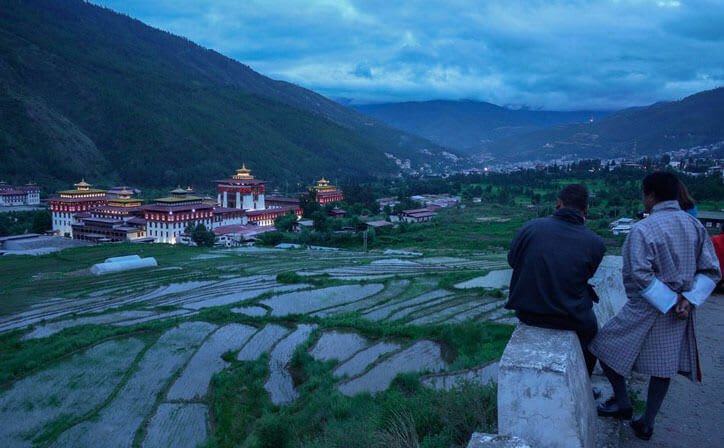 All of Bhutan's kings have been crowned here. 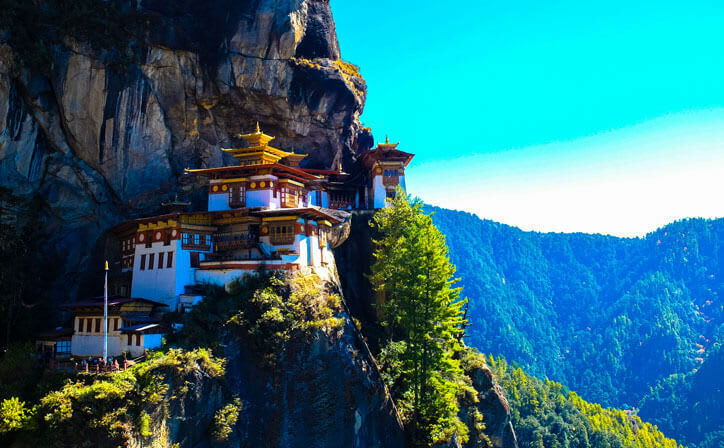 Clinging to a sheer cliff face, 900 hundred metres above the Paro Valley, Taktsang Lhakhang (Tiger's Nest Monastery) is Bhutan’s Machu Picchu, its Taj Mahal – the cliff-face that launched a thousand postcards. It features in every brochure, book and website about the country. 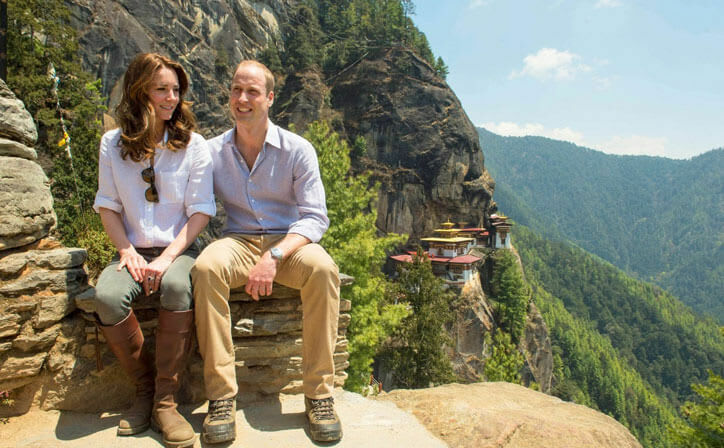 But, thanks to Bhutan’s restrictions on visitor numbers, it doesn't feel overrun. 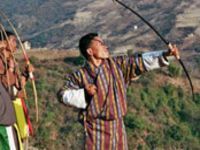 Archery is Bhutan’s national sport and is practised everywhere in the country. From local tournaments between friends to national competitions, the activity is taken rather seriously.